This study examined ad libitum fluid ingestion in older adults during intermittent exercise in the heat. Basically, they had continual access to water in one trial and Gatorade in another, and they had to cycle for 15 min and then rest for 15 min. 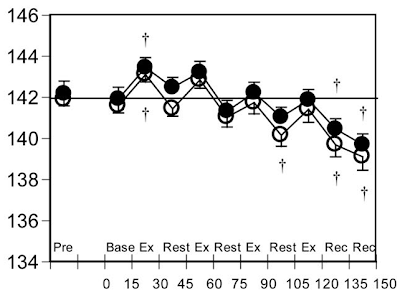 The total time of each trial was two hours (four work/rest bouts) followed by an additional 30 min recovery period. A number of variables were measured, but we will focus on the sodium concentrations. One limitation of this study for our purposes here is that it was performed in older adults, and there is a well-documented effect of age on the thirst mechanism so that as you become older you become less sensitive to thirst. That is, your plasma osmolality rises higher before thirst kicks in. 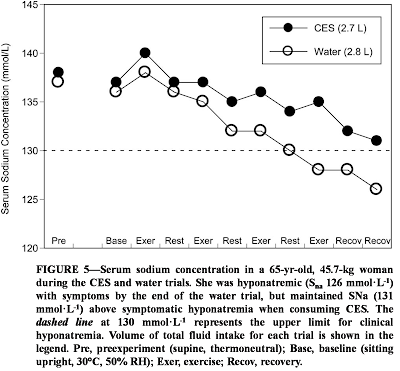 "Furthermore, this woman’s data support the notion that a CES [Gatorade] is superior to water in limiting reductions in serum sodium during exercise-heat stress. During the CES trial, this female subject consumed 2.7 L and had a final serum sodium of 131 mmol per L. Therefore, although she consumed similar amounts of CES and water, serum sodium was maintained above that of symptomatic hyponatremia during the CES trial." While the authors are entitled to their interpretation of the data, we disagree and conclude that both fluids are producing a steady fall in sodium concentration, and that the 131 value in the Gatorade trial is just marginally outside the symptomatic range (< style="font-weight: bold;">ingesting either water or Gatorade produced a nearly identical fall (~2-3 mmol) in the sodium concentration. In fact Jonathan tried to apply this finding to a more "real world" situation in a letter to the British Journal of Sports Medicine. In that letter he argued that since the mean finishing time of women marathoners in America is five hours, and if the ingestion of Gatorade at rates similar to those found in the study is advocated by races, coaches, scientist, etc., then there would likely be many women (and probably men, too) presenting with hyponatremia. 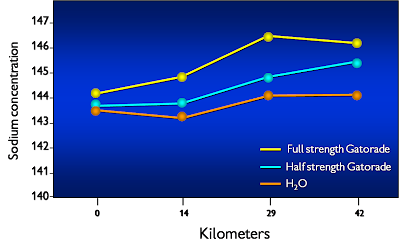 These data demonstrate that sports drinks do not prevent this condition as their ingestion in these subjects and at these rates causes a fall in sodium concentration. So in fact ingesting Gatorade to thirst in younger subjects results in a rise in sodium concentration, which is why you drink more---you never lower your osmolality below the thirst threshold and therefore are thirstier when ingesting a sports drink, whereas with water you maintain the osmolality right around the thirst threshold and drink and abstain as your thirst comes and goes. With sports drinks you instead just get thirstier, which seems kind of ironic since their slogan is "The thirst quencher!" So those are some of the data that support our conclusions, and we hope that helps to clarify some of our interpretation(s) and conclusions. We will still post a "wrap-up" for the series on cramping in which we will try to briefly summarize the main points but more importantly leave you with some practical advice on this complex topic! Today is a pseudo-Part V of our series on Muscle Cramps - I was tempted to call it Part V, but it's a little bit of a departure from what we've been talking about. In our next post, which we will be calling Part V, we'll wrap up this really challenging series and try to summarize all your comments and our posting into one post. But today, we build on the arguments from yesterday. In yesterday's post, we looked at how hypothesis creation in science must be evaluated with observation, and if the measurement or observation contradicts or fails to agree with the hypothesis, then the theory requires revision! Well, today, we want to apply that analogy to the issue of fluid and electrolyte replacements. It's an issue that we've touched on before, and even dedicated a post to, but it comes up so often in comments and questions, that we thought we should dedicate another post to it, and throw out some real figures, to prove a point. Are low sodium levels the result of a LOSS OF SODIUM in sweat, or is it the result of excessive fluid intake? Let's tackle that issue, with the aid of a regular runner - we'll call him Randy. The first, and most important assumption, is that we will have to treat Randy somewhat 'non-homeostatically'. I cannot stress just how important it is that we recognize that during exercise, the body is a finely tuned system, and is able to call on a number of different strategies for regulating its internal situation (this is called homeostasis). This is why we often measure things that are not predicted by equations - there are simply too many variables to factor in. For example, we often find that people do over drink, but they manage to regulate their body's sodium levels - this happens because they have other sources of sodium - hormonal regulation, renal function, and maybe even release of sodium from bone! The point is that we have to look at the body a little bit "coldly" in order to evaluate these arguments - when we consider what is actually happening, then it becomes EVEN MORE APPARENT that the supposed failures and problems like dehydration and cramps are unlikely to happen! In other words, we will present a number of scenarios where Randy would run into trouble. In reality, that would not even happen, because the body is so well regulated. We must assume body weight - we have assumed that Randy weighs in at about 70 kg. This means that his total EXTRACELLULAR FLUID VOLUME is 17 L.
We also assume that Randy is what Gatorade would call a "salty sweater" - this is someone who has higher than normal sodium levels in their sweat. Gatorade themselves can't define exactly what this means, but we've assumed that Randy's sweat has a sodium concentration of 100mM. Note that a fit, well-acclimatized person probably has sodium concentrations of about 20 mM, so Randy really is a "salty sweater"! We also assume that Randy runs for two hours, during which time he sweats at a rate of 1 L per hour (so Randy is running at moderate speed, hence the high sweat rate). As you will see, Randy's sweat, despite the fact that it's much saltier than most people's, is still very low on sodium compared to his starting sodium concentration (which was 140mM). As a result, his sweat is HYPOTONIC, and the end result is that his sodium concentration GOES UP - it ends at 145mM. Note that it is normal, though on the high side. In fact, when we analysed Comrades runners during our research studies in 2005 and 2006, we found that most runners finished the race with a sodium level between 140 and 145mM, and they were fine. So this scenario is actually pretty good! The table below shows the predictions for what would happen if Randy drank 500ml per hour - this is a reasonable rate for someone who drinks to thirst, though it does depend on the conditions. What you see from this table is that now, the sodium concentration will still be in the normal range of 135 to 145mM. Note that this scenario is again IDEAL - his sodium level is in the normal range, he's been drinking to thirst (approximately) and his physiological situation is 100% normal. In fact, the ideal and most common scenario in reality is probably somewhere between Scenario 1 and Scenario 2 - about 30% to 50% of sweat losses replaced would see you finishing in a "normal" range. You will notice from the last line of the table that Randy is now HYPONATRAEMIC - his sodium levels have fallen below 130 mM. This is usually going to land Randy up in the medical tent and could even have fatal consequences - people have differing sensitivities to a fall in sodium, but a value of 129 mM would be consider dangerously low. Quite apart from this, Randy has managed to drink 2 L in two hours, and so depending on how quickly he was running, he might feel very ill just from the strain of drinking that much - I would challenge you to drink this much, unless you are running fairly slowly and it's a hot day! Sweating causes some sodium loss, but because the sodium content of sweat is so low relative to body fluids, your sodium concentration will rise. And it is the concentration that is important, since this controls fluid shifts in the body. It is NOT possible, even for a "salty sweater" like Randy in these scenarios, to LOSE sodium through sweat. Rather, we have demonstrated that the only possibly theoretical way that the sodium level can fall is if Randy drinks too much. If he drinks more than he sweats, then he will really be in a lot of troube. For example, if Randy took Gatorade's earlier advice and drank 40 Oz per hour (1.2 L), then his sodium levels would fall to 125mM - OVERDRINKING can be FATAL. The first point we have to make is that Gatorade has a sodium concentration of 18mM - this is only 13% of what the body fluid concentration is, and only 18% of the sodium concentration of the sweat in our examples. It does not take a mathematician to work out that you cannot replace the losses if your replacement fluid is different from the original! But let's play with the numbers and see. So, what this table shows is that Randy sweats out 2L in his run, and loses 200mmol of sodium. However, because he is putting some of those electrolytes back, his overall sodium loss is 182 mmol - this equates to about 4.2g of sodium. You may recall from scenario 2 that if he drank just water, his sodium loss would have been 4.6g - the difference is therefore 0.4 grams! When you consider the volume of 17L that this is going into, then you begin to realise that the sports drinks are making a tiny, tiny difference to the body's sodium concentration! In fact, the difference is only about 1mM - Randy's sodium level would have been 136.4 mM with plain water, and it's predicted as 137.4mM on sports drinks! That difference is absolutely minimal - in fact, it's negligible. A few people wrote in wondering whether a 1 or 2mM difference might be important - I can assure you that it's not. If it were, then in the time you have taken to read this, you would have seen your sodium levels shift by this "critical" amount! So the bottom line - sports drinks simply DO NOT help prevent the fall in sodium levels caused by potential overdrinking. For our final scenario, consider what happens if Randy now drinks to replace all his sweat losses, but he drinks sports drinks instead of water. You may recall from scenario 3 that if he drank only water, his sodium level would be predicted to fall to 128.6mM - a level associated with hyponatremia. The table above shows that if he drinks sports drinks, then his sodium level will fall to 130.6 mM - this is a difference of 2mM compared to drinking only water. Again, this is a minimal, and negligible difference - the fact of the matter is that whether Randy drinks water or sports drinks, he still becomes hyponatraemic and could be running the risk of death as a result. Again, I have to emphasize - this difference of 2mM is insignificant - both final values are dangerously low, regardless of what he drank during exercise - and this was only in a two-hour run! To illustrate this, if Randy ran a full marathon and took 4 hours, following this same pattern of drinking to replace all his sweat losses with a sports drink, then his final sodium concentration would be 121 mM - he would almost certainly end up in hospital. Why? Because he drinks too much of a sports drink that is hypotonic and unable to defend the body's sodium concentration. So what is Randy to do? What is the best strategy? So, having run through these five scenarios, I hope it's quite apparent that if your sodium level drops, it is NOT because you are losing salt, it's because you are over-drinking! I hope it is equally apparent that drinking a sports drink does nothing to change this situation. So what to do? For our imaginary runner, the answer would seem quite obvious - don't overdrink! That only seems obvious because we get ourselves into terrible states of confusion by talking about what overdrinking means, and should we also supplement with salt? The reality is that most people will finish exercise with a normal or slightly elevated sodium concentration - this is in fact the normal, and desired response. In otherwords, of the scenarios we have looked at here, the "ideal" probably lies somewhere between not drinking, and drinking about 50% of fluid losses. If you do this when you exercise, your sodium level will not change substantially - it will be neither too high or too low. If you are thirsty, then drink! If you are not thirsty, then don't drink! Don't waste money on salt tablets - you don't need them! The problem that we (as a sports community) find ourselves in today, with this huge confusion, is the result of allowing ourselves to be treated as stupid. Yes, that's right - the companies that sell sports drinks think that you are too stupid to drink when you should, and that your body is too stupid to realise when it needs salt! Our species learned how to make fire, put a man on the moon, and created a communication system that allows you in Colorado (or wherever you are in the world) to read the words I am typing in Cape Town! But when it comes to drinking - we're just not capable! Surely that doesn't make sense! The reality is that your body is designed perfectly to regulate its internal environment unless you have some disease or potentially critical problem (being lost in the desert without food or water for a week is one that springs to mind!). Yet for some reason, every animal in the animal kingdom EXCEPT for humans is able to drink when they need to, eat the right foods and get the right nutrients when they need to! So forget the salt tablets, forget trying to work out what you need to eat and drink when you exercise, and just listen! Your body knows better! In this post, we've tried to illustrate some of the theoretically possible outcomes when you drink plain water during exercise compared to drinking sports drinks, which contain electrolytes. What we have shown is that the electrolytes in sports drinks make a very tiny difference - not enough to prevent hyponatremia from developing and certainly not enough to back up the marketing claims made by the companies who tell you that you NEED the electrolytes. We have used these mathematical scenarios to illustrate the theoretical point - I just want to point out again that in reality, when you do drink water and sports drinks, your body makes adjustments that prevent your sodium level from falling (up to a point - eventually, your poor physiology would be over-stressed and you would start to run into trouble!). So the reality is that even if you do make the mistake of drinking too much, your body does the best possible job of protecting you anyway. One example of such a mechanism is that when your sodium level begins to fall, you are no longer thirsty, and the body is actually even able to release less sodium into the sweat, just so that you conserve it! It's just as well that our bodies are so 'smart', because if we did not have these regulatory mechanisms, can you imagine how many people would be in serious trouble because they did not simply listen to the body and drink to thirst? So bottom line - drink to thirst, don't worry too much about what you drink, but just make sure you are getting enough ENERGY in - the one thing that the sports drinks provide that is required is glucose, and so plain water is unlikely to be sufficient for longer than about 2 hours of exercise. So that's it for today's little 'diversion' from our series. Tomorrow we will wrap up the cramp series, and put our minds to what lies ahead! Over the past week, we've taken what has turned out to be a pretty intense look at muscle cramps. We began with a discussion of how muscle cramps were first attributed to a low serum electrolyte concentration, without any substantial evidence for this theory. We then moved on to show that, in fact, people who cramped have the SAME electrolyte concentrations and levels of dehydration as those who do not cramp - this is pretty strongly suggestive that cramping is not caused by either dehydration or electrolyte depletion. Then on Saturday, we described a new model for muscle cramps, involving a 'malfunction' in the reflex control of muscles during fatigue. This series, more than any other we've written so far, has stimulated some telling comments and incisive questions. And we're very pleased with that - our intention here at the Science of Sport was always to stimualte discussion and debate, and we pride ourselves on the thoughtful and discerning readership we clearly have. In fact, we want to be challenged - we invite the sceptics and the doubters, because it's only through that type of discussion that we ALL work towards the truth! We put the evidence out there in what we believe is the most objective way possible. If that evidence is challenged, we enjoy the discussion, provided it's thoughtful and relevant! Of course, this creates a time-problem for us, because we can't respond adequately to all the excellent questions we receive. So the day is coming where we'll have to pass on responding to some of your comments and questions, unfortunately. For now, we do our best, but please bear with us if we can't turn around all the questions in the time we'd like to. However, what we would like to do today is to return to one particular issue which has come up again and again since we began this series - this is the issue of low electrolyte levels: Are they caused by loss of electrolytes in sweat? Before we get stuck into the actual question, I have to just step back and give a brief overview of how science evolves. I heard this analogy from a famous physicist named Richard Feynman - he of the Challenger explosion, and maybe the world's most famous scientist in the 1980's. It's the best analogy for science that I've heard. However, the more you watch, the more you measure, the more you add to your understanding. And eventually, there comes a point at which your initial hypothesis is disproved! For example, you suddenly notice that pawns can in fact move diagonally, if they are capturing an opponent's piece! Your initial hypothesis must now be revised, or it will be incorrect. As you go, you develop further - soon you discover a new piece - a bishop, which is only able to move diagonally. You also realise that a rook (or castle) can move in any direction except diagonally! And later still, you might discover that another piece, the queen, can move in any direction, forward or backwards! You can never see the whole board - in science, you are always looking at one piece of the bigger picture, and trying to make inferences from your observations and measurements. This has implications for how one can apply data to other areas - just because a pawn moves forward in my square doesn't mean it can't move diagonally somewhere else! For example, let's say that your initial hypothesis is that pawns only move in one direction. If you suddenly observe that they can move diagonally, you would be incorrect if you held to the theory that they move in one direction only! Your understanding of the game would be flawed as a result of your failure to reassess and change your hypothesis! The issue - can your electrolyte concentration fall as a result of sweating? In the interests of time (your time reading this, and mine writing it! ), we are going to leave the application of this important question over until tomorrow, when we'll throw some examples out there and prove that sweating does NOT cause low electrolyte concentrations. Now, let's assume that you are losing BOTH water and salt from the container. If you lose them in equal amounts, the salt concentration stays the same - for example, take out one cup of water, and one spoon of salt - you now have 9 cups water and 9 spoons of salt - the concentration is STILL 1 spoon/cup. So the next question, which I'm sure you're already asking yourself - when you sweat, do you lose more salt than water? Or is it the other way around, with more water lost than salt? The answer, which our regular readers will know since we've emphasized it previously, is that sweat is HYPOTONIC, which means that it has a relatively lower salt concentration than the plasma. Therefore, we're dealing with a situation where sweating would cause...an INCREASE in the body's salt concentration! We'll tackle this issue in tomorrow's post, where we'll throw some real physiological values out (as opposed to simple cups of water and spoons of salt! ), and show that low electrolyte levels, and hence cramping, cannot be caused by sodium loss in the sweat! It's all part of looking at the chess board, and changing the hypothesis! Today sees the third part of our series on muscle cramps. It was going to be the final installment in this particular series, but we've received some excellent and thoughtful questions and comments on the issue, so have decided that we'll do a fourth post, just summarizing some of those key "sticking" points. It seems from the feedback that this issue - electrolytes and cramps - is one of the more contentious ones around. So in our FOURTH post of the series, we'll look back and try to tie up any loose ends and conceptual issues. This theory has its orgins in a paper published in 1997 in the Journal of Sports Sciences, in which Professor Martin Schwellnus and some colleagues looked at the electrolyte-dehydration issue and concluded that on the basis of insufficient evidence, a new theory was required. They proposed, in this paper, that a cramp was the result of dysfunctional reflex control of the motor nerve as a result of fatigue. That sounds like a mouthful, and if we go into huge detail, then it could well be a very technical post. But we'll pull it apart step by step, hopefully without allowing the issue to become incredibly complex! This of course means potentially oversimplifying things and leaving out some details that are not directly relevant, but hopefully it'll be understandable for everyone, and stimulating to encourage further discussions, where desired! Your muscles are stimulated to contract by a group of nerves known as alpha motor neurons - in order for you to perform any motor task (touching your finger to your nose, cycling, running etc. ), a signal from the motor cortex of the brain travels down the spinal cord, before leaving the spinal cord and traveling to the muscle fiber along the motor nerve. Once at the muscle, the electrical signal being delivered is responsible for muscle contraction (via a process we won't go into here). There are other pathways that also affect movement, and of course, it's not so simple as a single impulse traveling down the spinal cord to the muscle - the complexity of a simple motor task, like placing your finger on your nose is absolutely astonishing, and it involves many other brain areas and muscle groups. But for our purposes, what is important is that when the alpha motor neuron activity is increased, then the muscle contracts. You've all probably heard of, or experienced, the classic "knee jerk" reflex, where a doctor (or a friend) taps on the knee tendon with a small hammer and you can't help but to kick out with your foot. Well, that simple test demonstrates the first important reflex. The muscle spindle is a tiny structure in each muscle fiber, whose job it is to make sure that the muscle does not stretch too much. So what happens is that every time your muscle is stretched, the muscle spindle activity increases. This sends a signal back to the spinal cord (along what are called Type Ia AFFERENTS), where the nerve impulse is passed on to the alpha motor neuron, and then back to the muscle. Hopefully, you will see that the end result of all this is that the alpha motor neuron will be active, leading to muscle contraction - in other words, if you stretch the muscle, the response is to eventually cause it to contract - this is protective, and prevents over stretching of the muscle. Now, there is a second organ in the muscle that plays a role in reflex regulation - it's called the Golgi tendon organ. The Golgi tendon organ performs almost the opposite role to muscle spindle it monitors the tension in the muscles and tendons, and it is active when the muscle is contracted and lengthened (which puts load on the tendons). It's role is to make sure that the muscle does not contract too forcefully or under too much load. So when the muscle is placed under load (any contraction), the Golgi tendon organ fires, and it sends a signal to the spinal cord along what is called a Type Ib afferent (remember the spindles had Type Ia afferents). This time, however, a key difference is that the Type Ib afferents tell the Alpha Motor neurones to STOP FIRING - they are inhibitory. In otherwords, when the Golgi tendon organ fires, then the alpha motor neuron activity goes DOWN. This would cause a reduction in muscle contraction. The effect, of course, is again protective, because it prevents the muscle from taking on too much load. So, the bottom line here is that if the Golgi tendon organ is stimualted, the end result is that muscle contraction is switched off. However, if the Golgi tendon organ is inhibited, then the alpha motor neuron activity will increase, and the muscle will contract even more - this is called "disinhibition". This is a pretty important question. The answer, of course, is the active muscles. This theory explains why, because the fatigue, which alters the activity of these two important reflexes, is most manifest in the active muscle. The electrolyte theory doesn't explain why only the muscles being used for exercise tend to cramp - in fact, if low electrolyte levels were the cause of cramp, we'd expect generalized cramping, as occurs in clinical conditions where people lose a lot of salt and become hyponatremic. It does not happen in exercise, but the Fatigue Theory can explain it. Here, the answer is that a muscle that crosses two joints will cramp more often. This makes sense according to the Neural Fatigue theory, because if a muscle spans two joints, then it means that the muscle is going to be in a shortened position when it contracts. Think of the calf muscle during swimming - your toes are pointed (the ankle is in plantar flexion), which means the muscle is contracting in a shortened position. When the muscle is in this position, then the activity of that Golgi tendon organ is going to reduced even more than normal. Add to this the contraction, which stimulates the muscle spindle, and the net result is that the inhibition of the motor neuron is reduced even further, predisposing one to cramp. This is why calf muscle cramps are so prevalent in swimmers (the only time I've ever cramped, incidentally), and also why, when you wake up in the middle of the night or sit in a strange position for a really long time, it's when you point your toes that you suddenly go into a fully-fledged cramp! In other words, it's actually the position of the muscle that predisposes to cramp. Here, the answer is a little less overwhelmingly in favour of the neural fatigue model, but it is still a good argument for it, and against the electrolyte theory. The answer, of course, is that cramps happen during racing and not training, and it happens only at the end of the race, when the athlete is most fatigued. One could of course argue that it's only at the end that the electrolyte levels drop to the point where it causes cramps, but we described in Part II that there's zero evidence for this. So the explanation now would be that the muscle becomes more and more predisposed to cramp as it fatigues. Supporting this, Schwellnus et al found that Ironman triathletes who paced themselves poorly and tried to cycle or run faster than they were capable of (based on previous performances) were going to be the ones to cramp. In other words, if a guy was capable of a 6 hour 180km cycling leg in the IronMan, and he tried to do it in 5h45, he would cramp. Note that this has nothing to do with electrolytes - he replaces the same amount, would lose the same volume of fluid, but he cramps because his muscles are not able to do the work he is asking them to! The resulting fatigue is what causes the cramp. The entire theory is built around this "end-result" that the activity of the alpha motor neuron is increased, due to the increased firing from the spindle Type Ia and the Golgi tendon organ Type Ib afferent fibres. Well, there is evidence that this is the case - the electrical activity of the muscles of cramping runners was measured after the 56 km Two Oceans marathon, and it was found that the alpha motor neuron activity was HIGHER than in non-cramping athletes. Of course, this evidence is by no means the "definitive proof," and as Jonathan mentioned in Part II, we need to figure out a way to study cramps in a controlled, prospective fashion. Then we would be able to analyse exactly what is happening. Until that happens, we have theories and models. But this neural fatigue theory is certainly the best available theory for the observations of cramps at the moment. I have little doubt it will evolve over time, however! Well done if you made it this far! I realise this is a pretty heavy post, and it relies on some level of physiology or anatomy knowledge, because there's a lot of jargon in the theory. That's something we prefer to steer clear of, but for this particular post, I felt it important to put out the necessary details. Of course, for some, we have probably oversimplified it, and please feel free to ask question. For the others, the take home message really is that "Fatigue causes cramps, by interfering with the normal balance of spinal reflex control - it switches on the alpha motor neuron and the muscle contracts involuntarily." Monday's post, which will be Part IV of the series, is a recap of some of the key issues in the electrolyte-fluid-cramp debate. I promise it'll be less technical than this one! In part one of this new series we tried to set the scene by providing some history in this area of muscle cramps. At times it might seem like we are a bit heavy on the historical side, but as we mentioned in one of our comments to Part I, understanding the historical record is crucial as often it helps us understand why we think what we do---and this affects one's interpretation of the science. In this post we will focus on the prevailing premise that dehydration and electrolyte disturbances cause muscle cramps. Recall that what is most often put forward as the cause of cramps is either dehydration or some electrolyte disturbance, but the data from these two studies do not support that hypothesis. Although these are field studies and we cannot assign a cause and effect relationship, this available evidence suggests that these (normal) levels of dehydration do not appear to cause cramps. If these levels of dehydration did cause cramps and were largely responsible for cramps, then what we should see is a very high incidence of cramps in all of the race finishers with the same physiological characteristics as these subjects----or in other words, the vast majority of the race finishers. So in Part III of this short series we will lay out the newest hypothesis that tries to explain the "why" and the "how" of muscle cramps. It is novel and, as you might have guessed already, has nothing to do with electrolytes and dehydration! So come back and join us for Part III of this series, and then join us for the comments and debate! As promised in yesterday's post, today we kick off our latest series - Muscle Cramps. We hope that none of you did cramp in the middle of the night, as we mentioned yesterday! Though if you did, we're sure you stretched your calf and avoided the temptation to point your toe! The same marketing vs scientific integrity debate exists for muscle cramps. The industry that has sprung up around the muscle cramp issue has spread far and wide. It includes Gatorade, who advocate the use of their drinks to replace the loss of salt which is, according to their research, responsible for the cramp in the first place! But more than this, there are dozens of products that claim to prevent cramp - next time you are in a pharmacy, take a look at the range - everything from gels, to creams, to pills, to effervescent tablets. All these products work off the same premise - the put back the electrolytes that exercise will take out. And it's the loss of those serum electrolytes, the theory goes, that are responsible for the cramps during exercise. This theory, over 100 years old, is one broad category of theories for muscle cramps. The second theory is that muscle cramps are caused by a 'malfunction' in the control of the muscle by the nerves - an abnormality of neuromuscular control which is caused by fatigue. Perhaps one of the first things to do is provide a definition for cramp, as well the usual disclaimer that we cannot possibly cover all the possibilities and scenarios in this series. Firstly, cramp has been defined as a "spasmodic, painful, involuntary contraction of the skeletal muscle that occurs during or immediately after exercise". Note that this definition applies to exercise-related cramps only, and therefore, it excludes a whole host of other possible cramps. We must point out that if you do suffer from very regular cramping, there are some conditions that can cause this - endocrinologic, neurologic, and vascular disorders, treatment with certain drugs, and occupational factors. Then of course, some cramps are what the experts call "idiopathic", which means they have no cause (but actually means we don't know what causes them, but it sounds better to say "idiopathic"!). If you are a regular cramper, it's probably worth seeing a doctor and just having an exam to determine whether any of these broad factors might be responsible. The earliest reports of muscle cramps come from 100 years ago, when labourers in hot and humid conditions of the mines and shipyards suffered from cramps. Even that far back, the sweat could be analysed, and it was noticed that the builders had a high chloride level in their sweat (chloride, incidentally, is one half of the salt in your sweat). The conclusion that was made was that the labourers were sweating out valuable electrolytes, causing their muscles (and nerves) to malfunction. The heat and humidity were key factors that caused this situation. It must be pointed out that no one prospectively measured the sweat of the labourers who DID NOT CRAMP, something that we'll look at in our next post. And perhaps rather surprisingly, that was it - based on those anecdotal observations, the theory which you probably hold true today, was born. That is, cramp is caused by a loss of sodium, chloride, and later calcium and magnesium were added to the mix. Heat and high humidity were implicated as "accessories", and the term "Heat-Cramps" was even conceived. According to this theory (as seen by this article and the "expert" testimony) , cramps happen because athletes exercise in the heat, lose electrolytes in their sweat, and the depletion combined with high body temperatures cause muscle cramp. "When a young athlete experiences heat cramps, pull him or her off the field into a cool area and gently stretch the affected muscle. "Have them drink, drink, drink, and then drink more," says Albert C. Hergenroeder, professor of pediatrics at Baylor College of Medicine and chief of the sports medicine clinic at Texas Children's Hospital. "High-sodium drinks will prevent children from getting heat cramps," says Jackie Berning, PhD, with the National Alliance for Youth Sports. "Gatorade has just enough sodium to prevent those cramps. But if you're a heavy sweater, and you're still getting cramps after drinking Gatorade, eat some salted pretzels or salted nuts. Those work fine."" There is of course more to it than this, but the essence is that the serum electrolyte depletion theory was created without any controlled, clinical studies to establish whether the depletion of salt through excessive sweating was to blame. Rather, the theory was picked up on and used to spawn the numerous products you can purchase today. But, as I'm sure you've guessed, there are some holes in it. First of all, there is a key conceptual problem here, and that is that when you sweat, you don't actually reduce electrolyte concentration. That is, there are certainly electrolytes in the sweat, but the concentration of these electrolytes is so low, that sweating is likely to make you HYPERTONIC, not hypotonic. We looked at this in our posts on fluid - when you sweat, you lose more water than electrolytes, because the sweat is HYPOTONIC. Therefore, sweating cannot lead to a fall in electrolyte concentration. What transpired was that Gatorade (and the rest of the 'industry', it must be said) developed the theory of "salty sweaters", which is the term they gave to people who they said have abnormally high salt levels in their sweat. Small problem - no one actually knows what a salty sweater is. How much salt does there need to be in the sweat before you are placed in this group? No one knows. Recently, Professor Martin Schwellnus, widely published in this area, posed this question to scientists at the Gatorade Sports Science Institute at a conference on cramping - he received no answer. The cramping paradox - why specific muscles? The second problem is something we asked you in yesterday's post. We asked whether the depletion of serum electrolytes would be expected to cause cramps in specific muscles, or all over? Hopefully it is evident that if a cramp was caused by a loss of serum electrolytes, there is no reason for the cramp to be limited to one muscle only. Rather, you would cramp everywhere. In fact, in people who have lost a great deal of salt and have become hyponatremic (not during exercise, but clinically), we know that they cramp in ALL their muscles. In the interest of time, we'll call it on this post for today, and say that in our next post, we'll tackle the electrolyte theory in more detail and look at some of the studies that have looked at people who cramp and those who don't and compare their values. Muscle cramp 'teasers'. . .